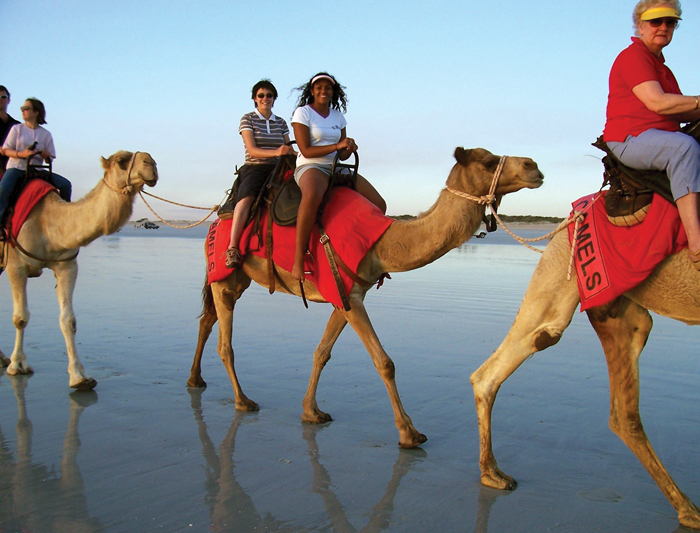 Get lost in the beauty of the Australian Outback on this intoxicating tour from the Top End to Western Australia. Spot wildlife around enchanting Lake Argyle, explore the soaring walls of Windjana Gorge, hike along narrow paths at Echidna Chasm and cool off in crystal-clear watering holes beneath cavernous gorges. The Outback is a truly magnetic place – experience it in all its rugged beauty on this 4×4 adventure through the red desert Kimberleys under the blazing Australian sky. Welcome to the tropical city of Darwin, where your overland adventure begins. After meeting up with your group and leader, head south and stop at either Edith Falls for a swim or explore Katherine Gorge in Nitmiluk National Park. This is where the group will have lunch (seasonal choice). Head to your overnight private campsite on the edge of Nitmiluk National Park, where permanent tents with swags await you. In the evening, settle down for dinner with the group. Note: Total driving time today is around four hours. Total walking distance is approximately two kilometres. After breakfast this morning, visit Lake Argyle, which has been created by the Ord River Dam. Admire the sheer size of this 700 square kilometre manmade spectacle with a walk around it. The ground near the lake can be quite soft so it’s a good idea to bring waterproof hiking boots. The lake is also home to many species of native fish and thousands of freshwater crocodiles. Take some time to explore the surrounds before setting up camp nearby for the night. Note: Total driving time today is around six-and-a-half hours. Total walking distance is approximately 2-4 kilometres. 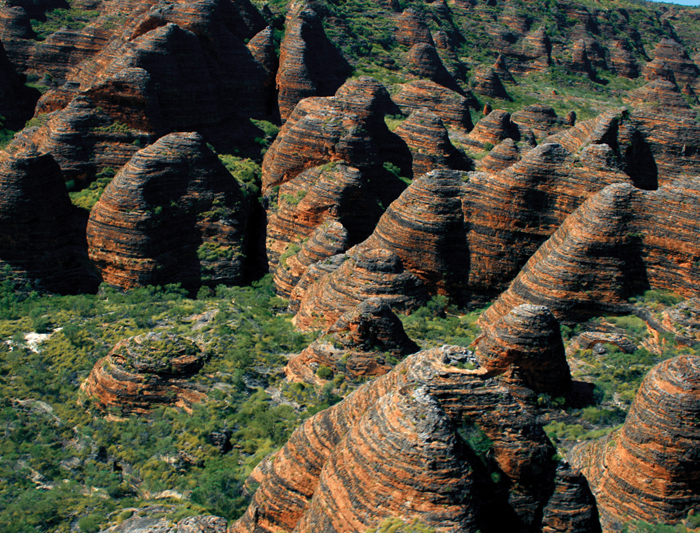 Today, head out in the 4WD and wind your way through the Bungle Bungle Range in Purnululu National Park. It’s a rugged ride but the scenery is fantastic. Explore the craggy gorges and red peaks of the Hidden Valley. In the late afternoon, use your free time to further discover the area. Enjoy your first Kimberley sunset at your bush camp. Note: Total driving today is around three-and-a-half hours. Total walking distance is approximately five kilometres. After breakfast prepare for a full day of activities, as the group heads back out to explore the remarkable rock formations of the Bungle Bungles. 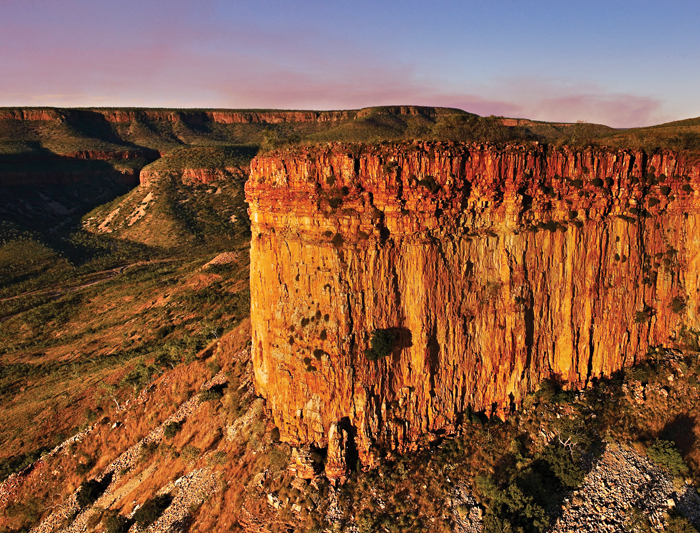 Hike to the thin, red gap of Echidna Chasm and the enormous Cathedral Gorge. There’s also the opportunity to experience a helicopter flight over the Bungle Bungles (at your own expense). As the sun goes down, head back to your overnight bush camp. Note: Total driving time today is around one hour. Total walking distance is approximately five kilometres. After breakfast today, get back on the road toward El Questro Station. Admire the remarkable scenery of the Carr Boyd and Durack Ranges, and head along the vast nature trail of Warnum (Turkey Creek), where you can take a refreshing dip. In the late afternoon, head to your campsite in El Questro for dinner and a cool drink. Note: Total driving time today is around three hours. Total walking distance is approximately six kilometres. Spend the day exploring the scenic gorges and red cliffs of El Questro Station. Afterwards, hike in the Cockburn Ranges and go for a swim under the waterfall at Emma Gorge. Tonight, enjoy another night at the El Questro campsite where you might enjoy a drink with the rest of the travel group at the station’s bar. Note: Total driving time today is around 45 minutes. Total walking distance is up to seven kilometres. After breakfast, spend the morning exploring stunning Manning Gorge. The waterfall here is wide and powerful, and there’s a large deep pool. You can swim right up and under the falls. After lunch you may be able to explore the gorges of Galvans or Adcock (depending on the season). This is the ideal opportunity to take some great pictures of local wildlife, so be sure to have your camera ready. This evening we camp at Mount Barnett by the banks of a crystal clear fresh water river, perfect to cool off in after your day hiking. Note: Total driving time today is around two hours. Total walking distance is approximately six kilometres. The western Kimberley region is full of endless stunning gorges that have to beexplored and this morning is no exception. After breakfast, adventure to Bell Gorge – a hidden highlight. This idyllic retreat, considered amongst the most beautiful gorge on the Gibb River Road, boasts cascading waterfalls and crystal clear pools filled with water from the wet season rains that fall in the King Leopold Ranges. Surrounded by a horseshoe of bright orange rock wall, there are smooth rocks to lounge on and welcome areas of shade. The afternoon sees you head to Windjana Gorge, a segment of 375 million-year-old reef that was once underwater. Cut through by the Lennard River, which runs during the wet season then breaks up into little billabongs during the dry, this gorge attracts many species of bird and bat and is a great spot to see wild freshwater crocodiles. Note: Total driving time today is around 2.5 hours. Total walking distance is approximately four to six kilometres. Begin the day exploring the Napier Range. The major attraction here is Tunnel Creek, an extensive limestone cave system that extends 750 metres underground. Inside, shards of sunlight stream in through crevices, little bats flutter about and enormous stalactites rear down from the ceiling. In the late 1800s, an indigenous man called Jandamarra waged a one-man uprising against European settlers, becoming a hero to his people. You’ll hear a bit about his legacy during a tour through Tunnel Creek, then make the final drive on to Broome, hopefully arriving in time for a stunning Cable Beach sunset. Note: Total driving time today is around four hours. Total walking distance is approximately four kilometres. Today we go out on a high with a Broome sights tour, learning about the rich history of the area in the pearling industry. We take the truck onto the beach for a picnic day this afternoon, and perhaps a few beach games. If you need to leave Broome today you can book a flight at any time.